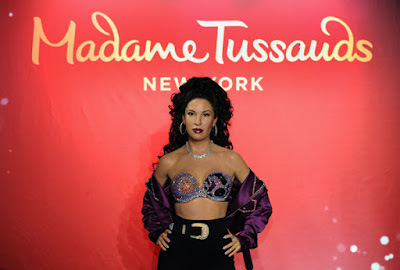 Madame Tussauds New York welcomed a new Selena Quintanilla figure at the legendary Times Square attraction. Selena's sister Suzette Quintanilla was present to share her excitement and introduce the "Queen of Tejano" to some of Selena's most dedicated and adoring fans. Selena's spirit has never been more alive as today also marks the official CD and DVD release of "The Last Concert." "It's an honor to represent the Quintanilla family today and to see my sister's figure met with such a warm and emotional reception," Suzette Quintanilla said. "I want to thank Madame Tussauds' amazingly talented craftsmen for creating such an incredible work of art." As well as unveiling Selena's figure, Madame Tussauds New York announced the creation of the all-new 'Sabor Latino' experience opening July 20. The attraction will transform its Music Zone to feature the most celebrated icons in Latin music history: Selena Quintanilla's figure will be joined by those of Jennifer Lopez, Ricky Martin, Selena Gomez and the first ever figure of "King of Bachata", Romeo Santos, whose latest single "Imitadora" was released on June 23 and highly anticipated album "Golden" will follow on July 21. "Sabor Latino is a celebration of Latin music and those who have reached iconic status for achievement in this category, from Selena to artists of today," Anna Domingo General Manager of Madame Tussauds New York said "It will be the first-ever dedicated Latin themed experience in Madame Tussauds' history and we can't wait to turn up the heat and share it with music-lovers this summer." Starting today, Quintanilla's figure will be on permanent display in the Times Square attraction. The "Queen of Kumbia" catapulted to global adoration in the 1980s and 90s and is the only Latin female artist to have five albums simultaneously on Billboard 200. Selena continues to win awards 22 years later, winning Female Artist of The Year at this year's Billboard Latin Music Awards. Sabor Latino will open exclusively at Madame Tussauds New York on July 20, 2017.